Turn it from drab to fab. "Shabby Chic" is just one term used to attempt to define the current recycled/reclaimed/vintage décor and design trend. Once you're drawn by a hip storefront, you'll quickly learn that one-coat chalk, mineral and milk paint are at the heart of "shabby chic." Transforming old gouged, stained, scratched or even glass and metal furniture pieces from "drab" to "fab" can happen in less than an hour. The soft matte finish requires no stripping, sanding or priming. "It's so easy to use, and takes so much less time," explains THOSE GIRLS' (616 E. Third) Shauna Kennedy-Carr, who along with FEATHER YOUR NEST (10621 E. Trent) gift boutique, sells and teaches novice-to-expert classes using American Paint Company, which touts zero-VOC (Volatile Organic Compound, which causes strong fumes) in its chalk/clay/mineral-based formulas. PAINT IN MY HAIR (3036 N. Monroe), ARTWORKS (15310 E. Marietta, Spokane Valley, and 2049 N. Main, Coeur d'Alene), TRELLIS MARKETPLACE (4102 S. Bowdish, Spokane Valley) and AGAINST THE GRAIN (409 First St., Cheney) are enthusiastic "Stockists" (certified instructors and retailers) for Annie Sloan's 32-color palette chalk paint and wax finishes that "antique" and texturize. Sloan, from England, isn't the only international DIY darling. 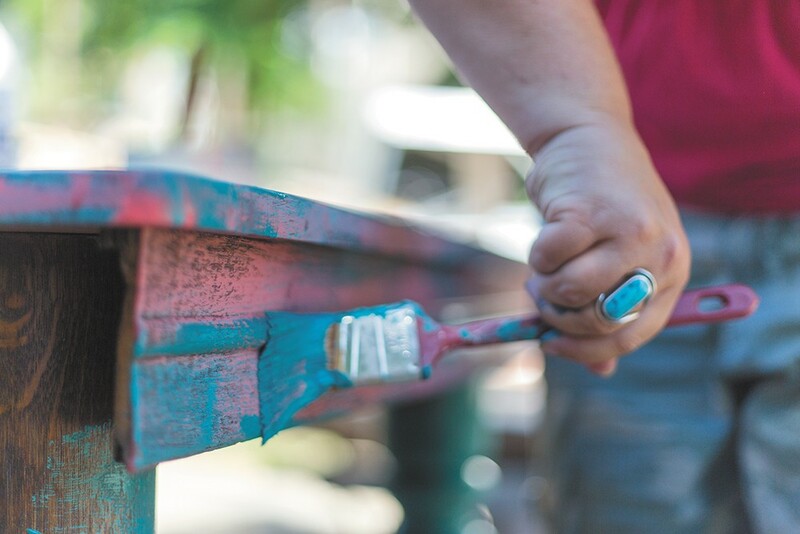 "Miss Mustard Seed" of Canada and her 18 colors of mix-your-own powdered milk paint have a "huge following," according to Coni Tanninen, who sells it at REJUVENATIONS (160 S. Lake St., Reardan), and offers twice-weekly paint classes. "I didn't want to jump on the Chalk Paint bandwagon," Tanninen admits. She prefers milk paint for its versatility: "I like it because it stains more than it coats. But you can add a bonding agent and use less water to make it thicker."